Local news outlet Jeju Sori’s annual Beautiful Marathon swings around for the seventh time on Sunday Oct. 5 as up to 3,000 runners are expected to run from 5 to 42 k.m. for charity, with 340 volunteer helpers. In a bid to increase foreign participation in the race, Jeju Sori has also pledged to pay all entry fees for international entrants. Such a spirit of giving is what makes this marathon stand out from Jeju’s other runs. Half of all registration fees collected are donated to charitable causes, amounting to over 130 million won since the race began in 2008. The entry fee is 30,000 won for the half and full courses and 20,000 won for 5 k.m. and 10 k.m. Furthermore, not only will international racers have their fees paid by Jeju Sori, but the news agency has pledged to donate 2 million won to local charitable organization Jeju Furey, making this the third time they have teamed up after smaller donations in 2010 and 2011. This year the donation is dependent on at least 50 international participants registering through Jeju Furey. (Click here to register). "We, as Jeju Furey, genuinely appreciate the donation and we are excited about this partnership as it enables Furey to be part of a cause that reaches beneficiaries beyond our own." The marathon starts and finishes at Gujwa Sports Park, in Gimnyeong-ri on the northeastern Jeju coast. The sports park on the day will be full of events for both participants and visitors including music performances, flea markets, food stalls, raffles and more. Jeju Furey in particular plans to organize ultimate and volleyball games on the grass, with flea markets and food stalls within the designated Furey tents. The Beautiful Marathon has many other beneficiaries beyond Furey and over the years has supported anti-literacy and flood-protection projects in Pakistan, Bangladesh and India. Causes closer to home include the Kim Mandeok Foundation, Jeju Migrant Peace Community, Jeju Beautiful Youth Center and local multicultural centers. 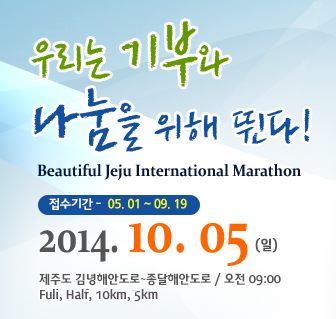 Registration: To ensure Jeju Furey is credited with your entry application, register for the marathon through this Jeju Furey event. Prizes: Trophies and prizes for first, second and third in each race with a top prize of 500,000 won for the marathon winner. Notice: First aid and medical care services will be on hand during the race and in the case of chest pain, body temperature drop, muscle spasms, headaches or other symptoms, participants should seek help from staff.